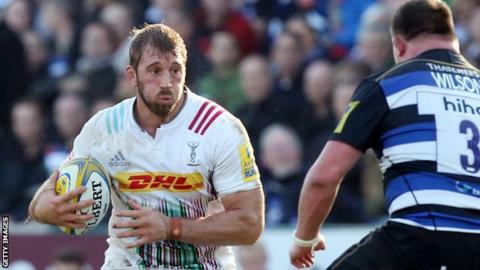 England captain Chris Robshaw has signed a new contract with Harlequins. The 29-year-old flanker, who has spent his entire career with Quins, has skippered the national side since 2012 but came in for criticism following their pool-stage exit at the World Cup. Robshaw was also Harlequins captain between 2010 and 2014 and led the club to the Premiership title in 2012. He said he was "honoured" to extend his stay at the Stoop, although the length of his new deal has not been disclosed. Robshaw came through the south-west London club's academy and has made 210 appearances since his first-team debut in 2005. "The club feels like an extended family to me with its amazing players, management and supporters," he said. "I'm looking forward to seeing what the future holds and I'm extremely excited to keep pushing for silverware with both Harlequins and England." Robshaw won the first of his 43 caps for England against Argentina in 2009 and has been captain since making his second international appearance. However, he was criticised during this year's World Cup for turning down the chance to kick a late penalty in the 28-25 defeat by Wales. Quins director of rugby Conor O'Shea said Robshaw had "everything you want in a rugby player". "Chris has achieved incredible things in his career to date," the Irishman told the club website. "He deserves recognition for what he has done, and will continue to do, for this game. "I'm sure everyone at Harlequins will be delighted with this announcement and will look forward to seeing Chris playing in a Harlequins and England shirt for many years to come."